The contents of this volume in Elsevier’s attempt at the collected works of Godfried Bomans reflect most accurately the kind of work Bomans is second best remembered for, after Eric. Fairly long, whimsical pieces of prose. Bomans was at his best when he was writing whimsical little anecdotes (although… not that little — he took his time) about general subjects. Sometimes, as with the report of Verlaine’s visit to the Netherlands, it’s very hard to separate sense and nonsense, to discriminate between what’s true, and what originated in Bomans’ lively imagination. On the other hand, where he describes his prowess as a chess grandmaster, or Arie Rekelbast, the famous soccer champion of the Haarlemmer soccer club De Spaarneboys, it’s very clear what one should believe, even fifty years later. Bomans practices a form of wit, of whimsy that is far superior to anything that might be called wacky, zany or hilarious. His Dutch is cultured, in of a certain Roman-Catholic type that is typical for some authors from his, like Havank. I’m not sure how I arrived at the website of the Times Literary Supplement and found a review of a book based on Henriette Lucie Dillon La Tour Du Pin Gouvernet’s memoirs, “Journal D’une Femme de Cinquante Ans”. But is fascinating reading, these memoirs of a lady who was a maid-in-waiting to Marie Antoinette and who lives through revolutions, wars, exile and everything. And I was so glad when I found the e-text! It was only released on March 15th… I haven’t read a lot of French lately, but the nineteeth century French Lucie Dillon writes is really easy to read, probably because the French I was taught at school was already fifty years out of date back in the eighties. But now for the sad part: it’s only part 1! The fun bits, where she lives in America as an exile, making her own butter, and where she returns to Europe to hob-nob with Napoleon are missing! Please, Mireille Harmelin and Eric Vautier, I want to read on! My book on Python and Qt programming — which has always been plagued by availability problems and a publisher who managed to fail to get it into Amazon — is finally obsolete: Mark Summerfield’s Rapid GUI Programming with Python and Qt has just been published by Prentice Hall. I haven’t read it, but I’m quite confident that it’ll be an excellent book. As someone who has purchased or rated books by Saint John Chrysostom, you might like to know that “Fixed-point Signal Processors (Synthesis Lectures on Signal Processing)” will be released on September 7, 2007. You can pre-order yours by following the link below. Since October 2003 I have learned to appreciate the C++ programming language. In fact, the better I get acquainted with C++, the more I like it. So, after having read Practical C++ by Ouailline, C++ in a Nutshell by Lischmer, Accelerated C++ by Koenig and Moo and a few others, and after having touched half a million lines of C++, I thought it time to go to the master for instruction. Which is why I bought a second-hand copy of The Design and Evolution of C++, and later also The C++ Programming Language. Even though it’s an old book, dating back to 1994 (stone age, practically, no mention of Java or Python in this book), TDaEoC++ was exactly right for me. I like reading the combination of a historical treatment and a discussion per “feature” or “problem area” much more than a language specification or a tutorial-style book. I feel I’ve got a much better understanding of why things are the way they are in C++. Of course, it’s also an advantage that Stroustrup is a clear and entertaining author: not too dry, but not trying to be overly funny either. If I wanted to niggle I’d say that Stroustrup is a little too defensive, although that’s understandable given the flak that C++ has been getting since its inception. Larry Marso wrote to the KImageShop mailing list in January 2006 about this book (two chapters are freely available). 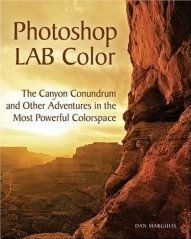 It deals with the LAB colorspace and the ways LAB makes it easy to completely mess up, I mean, fix, your photographs. Larry wrote us because just then we had added a 16 bit/channel LAB color colorspace to Krita, more because we needed it as an intermediary than because we knew what people would actually do with it. Now, about a year later, I decided it was time to get the whole text and see whether Krita can Do This, too, already. I haven’t started with that yet, for two reasons: first, I was in hospital, second: the demo files that come with the book are not in nice application-independent TIFF (or OpenRaster…), but in PSD, PSD > version 6, to be exact. I have to hope that Cyrille Berger hurries up with his libpsd (which he’s developing together with the Scribus people). Until that’s done, I’ll just have to content myself with reading the book. There’s no doubt that there is a lot of interesting and good information in it. I really want to give Margulis’ recipes a try with Krita, and improve Krita where necessary. But at the same time — oh my gosh! Margulis is a crashing bore. He’s self-important, self-congratulatory, wordy — in short, nearly unreadable. Still, I’ll probably wrestle my way through most of it. I had to go to hospital for a small operation (that nonetheless entailed my first night in a hospital), so I had to have some light reading. This book looked like the most likely satisfying on the fantasyand science fiction shelves of the local bookshop. I had never heard of the author, which is a plus for me, and the world building seemed quite nice, even if a little derivative, with strong echoes of late Byzantium and a map that looked a bit like the Black Sea. And despite being the first of a series, it didn’t seem the usual hackneyed first part of a polylogy, but a rounded story. for my nose-stuffed-up-with-sponges-and-bandaged self. Only near the end it seemed as if Patricia Bray got into trouble: she has set up her various plotlines so that there simply isn’t good or bad anymore and it becomes difficult to emphathize with any of the protagonists. But that’s quite realistic, too, and the depictions of imperial politics, while not quite as convincing as, say, Psellus (who really was in the thick of it), are convincing. Another strong point: the main protagonist’s condition remained a mystery to me for as long as it remained a mystery to himself, despite carefully crafted hints. To me that shows that this is a well-crafted story. I’m looking forward to the second story about Josan — even though the preview at the back seems to hint that he won’t survive the first twenty pages. In Krita 2.0, we will be using OpenGL much more than we already do in Krita 1.5, so I need to learn. When ordering the two basic books, OpenGL Programming Guide and OpenGL Shading Language, Amazon gave me Open Source Game Development, Qt Games for KDE, PDAs, and Windows as a related choice. 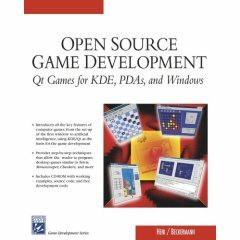 I was a bit surprised: a whole book on coding games for KDE? But, well, it had an introductory chapter on OpenGL, and I thought that might help me ease into the topic. It turns out this book is a really excellent, well-written concise and clear introduction to coding for KDE. Not just for coding games, but the whole thing. The ideal beginner’s introduction for people who are interested in coding for KDE. Of course, it doesn’t deal with CMake yet, although there is quite decent coverage of Qt4. And the OpenGL chapter is just what I needed, too. Buy this book, is my advice! I am reading AnIntroduction to the Old Testament in Greek. Additional Notes by Henry Swete. The Grand Rapids seminary (mildly famous in the Netherlands because they revere our Kuyper, while we have almost forgotten about Abraham de Geweldige) have scanned the 1914 edition of this massive book, tagged it using something called “theological xml markup” and prepared a public domain pdf. With all the Greek, Hebrew and everything intact. It’s really a great read, and I wish I had a similar book about the Hebrew old testament and another one on the New Testament, with a final volume on the apocrypha. Because what reading a book like Swete’s teaches you (and I guess it’s horribly out-of-date, but the findings in this book still haven’t filtered down into the common conciousness) is that life is complicated and that you cannot simply assert that some bible text is the undisputed text unless you delve really deeply into the gentle art of textual criticism. The same holds for the classical texts. Already Varro spent considerable time correcting manuscripts of Plautus, trying to find out which ones where authentically Plautus, and which versions where the ones most like what Plautus had written himself. So, my nicely bound copy of Rahlf’s edition of the Vatican Codex (B) of the Septuaginta inspires more confidence in the correctness of the text than is really warranted when confronted with so old a set of texts. text will be just as messed up, but in a different way. So the masoretic Hebrew text from the second century (although the earliest monuments are later than that) is not the definitive text. On the other hand, Swete calls the translators of the Psalms “obviously incompetent” and the translator of Job “more familiar with Greek pagan literature than Hebrew poetry”. were being written up to the 50 BC, and often immediately translated into Greek for the benefit of Epyption Jews. together with the obvious historical continuity from Alexandria (where the first translations where made) even to the 17th century secondary sources Swete urges us to consult when in doubt about some finer points, to Swete himself, I was getting interest in textual criticism, so I took down Scribes and Scholars by Reynolds and Wilson from the shelf. Nothing like having your computer broken for regaining an interest in old passions (funny: I had never realized passion come from Greek “παθη”, which I encountered today when reading the day’s Gospel (mark 9, 10-15), and which should be written with an accent and a iota, but I don’t know how to do that with the Greek keyboard map.). Scribes and Scholars is a very good book and I should replace my second edition with the third edition, and at a couple of points made me pause to ponder deeply. Schmemann, one of the greatest Orthodox theologians, has written an entire book about the history of accretions to the Orthodox liturgy: Introduction to Liturgical Theology. (I have somewhere the draft of an essay on why his approach is not quite scholarly enough because he uses the apparatus of historical linguistics in the wrong context, namely he’s try to explain a synchronously working system through diachrony, and because a blanket denunciation of accretions equals the assertion that the Holy Spirit is no longer active in the church.) The Protestant churches came from a quest for restoration to the purity of the Apostolic church, and since then returns to apostolic norms have succeeded each other quickly. Accretion and a return to purity happens in software, too — where it is mostly generational. I mean, a language gets bloated, like Java or Python, and then a new, small language is created. Which will get bloated with everything imaginable. Applications grow until they include the kitchensync, and then Kate replaces Emacs. (Note I’m carefully not saying anything about Gnome and KDE, although I thought the LWN discussion rather fun). There is something natural and inevitable in this dance. In general, nothing gets ever thrown away, but there are points in time where a reduction of accretions happens all by itself. For instance, at a certain point in time schoolboys in Constantinople were a bit overloaded, couldn’t be bothered to read everything by the Attic dramatists, and their kind teachers reduced their load to three plays by each tragedian and Aristophanes. Result: the rest of these plays would have been lost if Italian visitors hadn’t abducted the few remaining manuscripts of the rest of those plays. Which, of course, immediately reminds me of the very reduced curriculum my own kids get taught. But if I start writing on that topic, I’ll degenerate into mere ranting. And this entry is too long as it is. But then, Swete’s book is 912 pages. Oh dear… Someone has been reading Frazer’s Golden Bough again, And where Wrede and Stevermer’s The Grand Tour is fun with dark edges, American Gods is weirdness with leaden edges. It’s the kind of book you open, and then suddenly find that you’ve read sixty, maybe a hundred pages without the text leaving much of an impression. Fluent wordwooze, was my impression. And then it starts to get seriously weird and complicated. Not to mention philosophical, but you need to bring a lot more than rehashed nineteenth century scholarly superstitions to faze me (fortunately the book has a happy ending, even if the bit just before the ending is just as unsatisfying as the ending to Cryptonomicon.) But I’m not impressed by a comparison between a television and an altar. That’s been done before, on Dutch television, too, or so I am told, not having one of the machines myself. But in the end, a well-constructed story with some very interesting people in it — it’s just that I wish that these books would have an ending that was as good as the middle.